This will prevent Wren from sending you messages, friend request or from viewing your profile. They will not be notified. Comments on discussion boards from them will be hidden by default. Sign in to Goodreads to learn more about Wren. We’d love your help. Let us know what’s wrong with this preview of Ruse by Cindy Pon. We’d love your help. Let us know what’s wrong with this preview of Boy Meets Boy by David Levithan. "ARC provided by the publisher via Netgalley in exchange for an honest review. I did enjoy it, but it wasn't incredible. I liked the characters and their dynamics but I felt like I spent the whole book waiting for something to happen, im not a big fan of books that just recount a whole history. I was told after about 30 pages in that nothing really happened and that I should stop expecting something, and that did help, but I did find it hard to get into in the beginning. The middle though was a ton of fun, it was probably the part of the book I enjoyed the most. Being in the thick of the drama/moods/conflict of an up and coming rock band was definitely what I signed up for when I started this book. Also, I had some issues with the format/style. Because it was written to feel like a biography of sorts (or maybe more of an interview? I can't remember exactly what the intended format was) I found it hard to connect. Often biographies are enjoyable because the reader is interested and familiar with the subject prior to reading, but because this was fictional, I found myself not as interested in the band as I had hoped? Does that make sense? Wren (WhatWrenReads) has read 15 of 20 books. 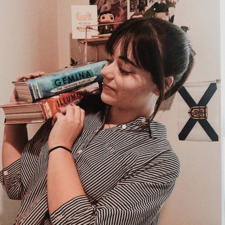 Wren (WhatWrenReads) read 62 books of her goal of 20! Wren (WhatWrenReads) read 42 books of her goal of 30! Take a look at Wren’s Year in Books. The good, the bad, the long, the short—it’s all here.